Virginia Elite has designed an opportunity for non-Virginia Elite athletes to receive elite training and comprehensive setting instruction. Our setting academy provides both developing and experienced setters with the regular technical training, instruction, and repetitions. All academy participants are instructed in the basics of the setting position including footwork to the ball, hand position, release on the ball, and setting tempo. Participants train for speed, accuracy, consistency, and decision-making. While all participants learn the same foundations of setting, they will also learn (when appropriate) more advanced techniques such as jump setting, tracking the block, holding opposing middle blockers, and game strategy. 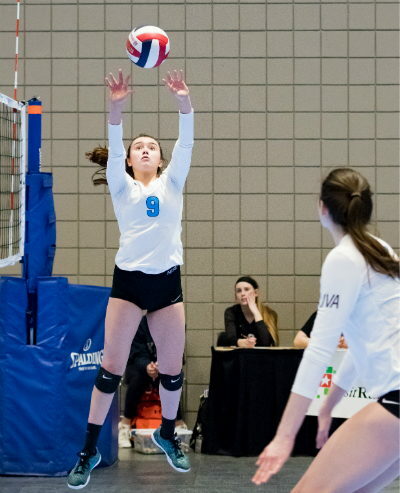 Virginia Elite Setting Academy is also beneficial to athletes interested in learning to set. Attendees: Middle & high school boys and girls with volleyball skill training and playing experience on middle/high school and/or club teams. Space is limited to 12 athletes per session. Schedule: Five separate 4-week sessions per the schedule table below. Please check here frequently for date/time changes due to scheduling conflicts, as well as, the website calendar.